Brinker Capital. Focused on better outcomes. Our dynamic and seasoned team of sales professionals is dedicated to providing quality service and support to the advisors that we partner with. Our team of specialists strive to build trusted, long-term relationships with you and develop investment programs that help your clients achieve their most important financial goals. As a company that embodies trust, respect and teamwork, Brinker Capital is dedicated to making a difference in the communities that we live and work in. Brinker Capital employees are dedicated and talented individuals who represent our core values by building open and honest relationships with our clients and colleagues, all while pursing growth and learning opportunities. Partner with Brinker Capital to help manage the assets to support your institution’s goals. Brinker Capital offers fully bundled or unbundled retirement solutions that provide fiduciary coverage to employees. Our time-tested investment process focuses on asset allocation, manager selection, and portfolio construction to deliver better outcomes. Time-tested strategies, innovative technology and a proven investment philosophy to help save, plan and protect a retirement plan participant’s assets. You are now leaving the Brinker Capital website and entering the Crystal Strategy Fund website. Information provided for these Collective Investment Trusts is intended for use solely by retirement plan sponsors, their consultants, and advisors. Participation in these Collective Investment Trusts is governed by the Declaration of Trust, and is limited to Eligible Trusts that are accepted by Benefit Trust Company. Eligible Trusts include (i) certain employee benefit trusts qualified under Code Section 401(a) of the Internal Revenue Code of 1986, as amended (the "Code") and exempt from taxes under Section 501(a) of the Code; (ii) certain governmental plans or units described in Code Section 457(b); and (iii) certain insurance company separate accounts comprised solely of assets belonging to Eligible Trusts as described above. Collective trust investments are not available to the general public, but rather only to qualified retirement plans which meet eligibility requirements. The Collective Investment Trusts authorized by the Declaration of Trust, and maintained by Benefit Trust Company as Trustee are not mutual funds and are not registered with the Securities and Exchange Commission, or any other regulatory body. In order to view the information regarding the Collective Investment Funds, you must certify that you are (i) a representative of an Eligible Trust; or (ii) a financial professional licensed to sell collective investment trusts to such representatives (each a "Qualified Representative"). By selecting "Continue" you understand and agree to the terms above and are certifying your status as a Qualified Representative. Our comprehensive process is overseen by the Investment Committee, consisting of experienced investment professionals, which meets on a regular basis. The group reviews and evaluates the insights of two sub-committees: the Asset Allocation Committee and Manager Research Committee. 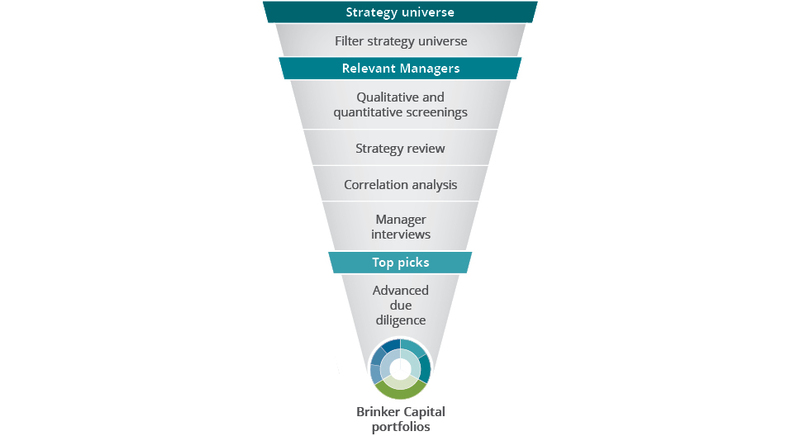 These areas all work together to inform Brinker Capital’s investment management decisions. The Asset Allocation Committee sets the long-term strategic asset class weightings for all portfolios, including active and passive allocations, working to identify cyclical secular trends to generate alpha through asset allocation. The Manager Research Committee maintains and executes a comprehensive due diligence process to identify the right managers to meet the strategy objectives and add value. Our investment professionals are integral to all portfolio decisions. Portfolio management teams consider the recommendations of both committees when making portfolio construction decisions.